OSAKA — A former Hanshin Tigers pitcher who had an unheralded career has achieved a feat no ex-professional player has achieved before — to become a certified public accountant (CPA). 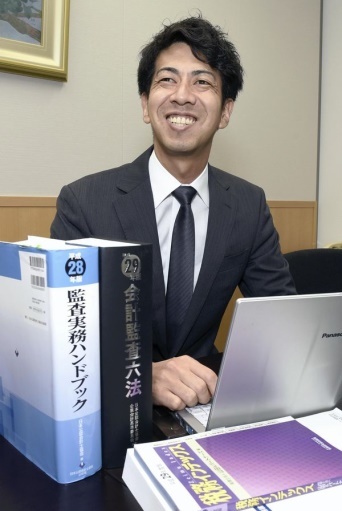 In June, Takehiro Okumura, 38, was officially registered as a CPA after finishing his training period. After ending his professional baseball career in 2001, Okumura frequently changed jobs, but one day he made up his mind to take on the CPA exam, which is said to be as difficult as the bar exam. Okumura is a native of Tajimi, Gifu Prefecture. Hanshin drafted him out of Toki Commercial High School with its sixth pick in the 1997 draft. Okumura joined the Tigers in spite of his parents’ opposition, believing he could “enter the world of [his] dreams.” However, life as a pro baseball player was not easy. He practiced hard but was dogged by a right elbow injury and other injuries. 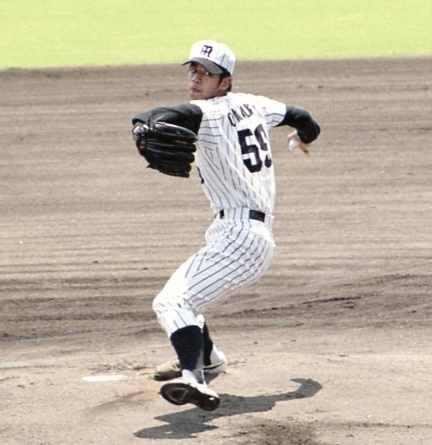 Having never made the first-team roster, Okumura was notified in 2001 that his contract would not be renewed for the next season. He became a batting-practice pitcher but was let go after one year, marking the end of his career in baseball. Afterwards, he opened a bar with an acquaintance in Osaka. He wondered, however, if he was on the right track and soon quit the venture. In 2004, while working part time at a hotel kitchen and pondering his future, Okumura came across an ad reading, “Certified public accountants can succeed as business specialists through their knowledge of bookkeeping.” This prompted him to begin studying for the CPA exam. The exam is extremely difficult with a pass rate of around 10 percent. Non-college graduates are required in principle to pass a preliminary exam, though Okumura was aware of relaxations to this requirement from 2006. He had previously obtained a grade two bookkeeping certificate while in high school. “I realized this was the path I should take,” Okumura recalled, adding that he felt like he had found light amid the fog. He attended a preparatory school, studying for five hours on weekdays and 14 hours on weekends during the busiest stretches. CPA applicants must first pass a multiple choice exam before taking a written exam. Okumura failed the written exam three years in a row up to 2011. The repeated setbacks pushed Okumura to the brink of quitting. His wife chided his attitude, telling him: “You’ll have given up on baseball and a career in accounting. Will you live the rest of your life backing down from obstacles?” His wife’s words inspired him to continue. In 2013, Okumura finally passed the CPA exam and interned at an auditing corporation in Tokyo. He passed the completion assessment, the equivalent of a graduation exam, and on June 21 this year, he was registered as a CPA. He currently works at the corporation where he interned. “To devote oneself to a sport without constraint, it’s important to have broad contact with society,” Okumura said as he contemplated his life’s trajectory. “I’d like to draw on my experience to help retired athletes make a new life for themselves.